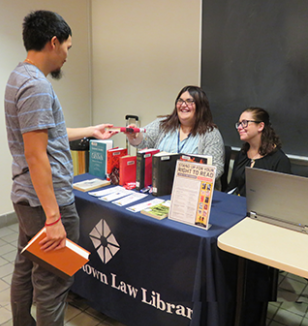 Each spring, the Law Library conducts a survey of our students. In 2017, 276 students responded to our survey, and we published summary charts of the responses back in April. Now we’re publishing a survey response, to show examples of changes to library facilities, content and services guided by the useful student input. We have published the 2017 Law Library Survey Response, where you can see highlights of new hydration stations, new Xerox printers which may also be used for copying, scanning and faxing, the installation of white sound machines in group study rooms, and a new research guide on the history of civil rights in the United States. 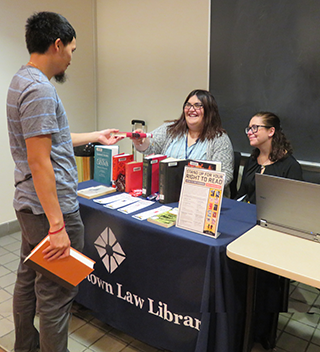 This entry was posted in Database News, Georgetown News, Legal History, Library News, News for Students, Research, Uncategorized on September 8, 2017 by Laura Addiego Prospero. We have concluded the 2017 Annual Student Survey for the Georgetown Law Library. This year, 276 students responded. Thank you. We appreciate all feedback. All students who completed the survey were eligible for a prize drawing. Congratulations to our four student winners: Gary Dreyzin (JD ’18), Cody Moshe Kermanian (JD ’18), Alexandra Katherine Rose (JD ’19), and another law student (JD ’19). Each student received either a $50 deposit to his or her GoCard account or a $50 Amazon gift card. Thank you to all 276 students for participating in this year’s survey. We’ve already started reviewing responses, and we’ll use this input to inform decisions about services and resources. You can view 2017 quantitative charts and a response summary on our website. 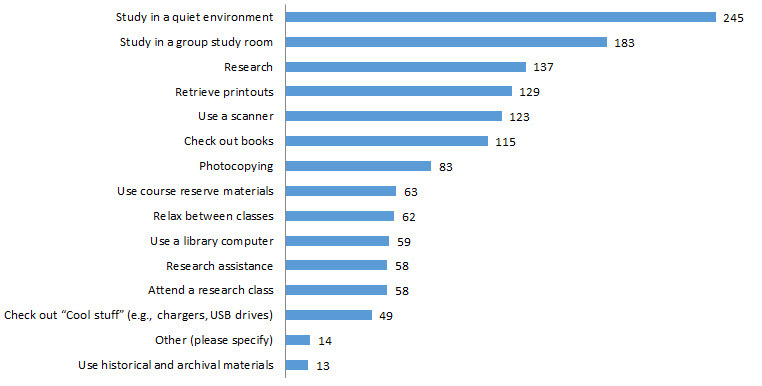 The second-most frequent reason listed is to study in a group study room. The library will once again provide additional group study rooms during the exam period. From April 24 through May 15, unassigned Scholar Studies will be available for reservation in addition to our usual 21 group study rooms. Scholar Studies are smaller spaces that accommodate a limited number of students, 2 at maximum. These studies will require only one Law NetID and can be reserved up to 5 hours a day. Go to the Group Study Room reservation page to reserve these study spaces. We will publish a summary response at a later date. Students and others are encouraged to give us feedback at any time. This entry was posted in Georgetown News, Library News, News for Alumni, News for Students, Research, Technology News on April 28, 2017 by Laura Addiego Prospero. Each spring, the Law Library conducts a survey of our students. In 2016, 245 students responded to our survey, and we published summary charts of the responses back in April. Now we’re publishing a survey response, to show examples of changes to library facilities, content and services guided by the useful student input. We have published the 2016 Law Library Survey Response, where you can see highlights of new hydration stations, new shelf guides for locating materials within the stacks, as well as the introduction of the OneSearch tool for discovering articles, books, databases, and other resources from many places. We appreciate student input. Throughout the year, you are encouraged to send comments and suggestions through our suggestion page, and please keep an eye out for our next annual survey in spring of 2017. This entry was posted in Uncategorized on October 7, 2016 by Laura Addiego Prospero. We have concluded the 2016 Annual Student Survey for the Georgetown Law Library. This year, 245 students responded. Thank you. We appreciate all feedback. All students who completed the survey were eligible for a prize drawing. Congratulations to our four student winners: Joshua D. Blume (JD ’19), Briana Rose Pigott (JD ’16), Christopher J. Balser (JD’18), and another law student (JD ’17). Each student received a $50 deposit to his or her GoCard account. 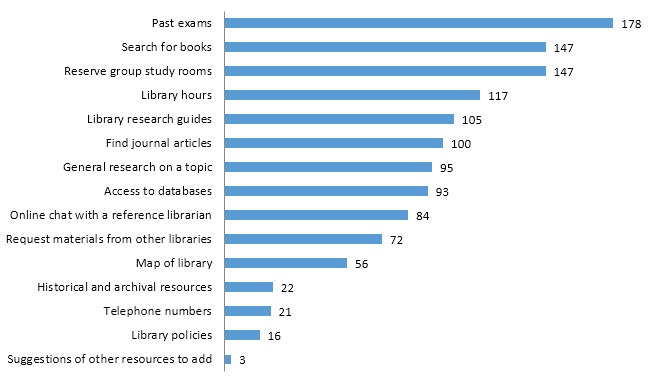 The second-most frequent reason listed is to search for books. To facilitate searching in our stacks the library has recently installed new shelf guides in both the Williams and Wolff libraries. These guides protrude out from the end of the ranges to enable quick recognition of what is held in a particular shelving area. We hope that these guides will assist you in locating materials within the stacks. This entry was posted in Georgetown News, Library News, News for Alumni, News for Students, Research, Technology News on April 1, 2016 by Laura Addiego Prospero.